When your solar system is rebuilt, it will look quite different. A solar system consisting of eleven planets will then orbit your Sun. The specific timing of your solar system's changes are being regulated by transformations occurring inside your planet. Envision your beloved Mother Earth as a living entity. This marvelous Being is your home and your most important responsibility. She is being watched over in your temporary absence by your planet's cetaceans. The whale song of the cetaceans maintains the biosphere, encouraging the annual reproduction of all living species in Earth's biosphere. It also accomplishes something else. Whale song interacts with Mother Earth's magnetic and gravitational fields. In this way, whale song contributes to the stability and coherence of the planet's primary, life-giving pulses. Each year, the cetaceans modify this song in accordance with the divine wishes of Mother Earth. Our purpose has been to aid the Elohim and the cetaceans in carrying out this critical task. We have dispatched many scientific observation teams to closely monitor the health of your planet. See your world as a great, living platform supporting your consciousness and its future expansion. With a healthy platform, your transformations can occur as planned. In many ways, the parameters for your changes are very fragile. That is why we are here to assist you. However, we wish to make it perfectly clear that this first contact mission is special. It is only designed to aid the metamorphosis of your society. Our primary objective remains your solar system's eventual membership in the Galactic Federation of Light. the exact moment at which we openly arrive will occur much sooner than many of you expect. First contact is meant to unify your society while simultaneously expanding your personal sovereignty to its fullest potential. In addition, it is a time to transform your reality and to manifest creative solutions that can heal your many problems. This society, once perfected, can furnish its citizens with acciess to the truth of their real purposes and identities. This procedure, along with advanced technology, can rapidly accelerate your society to full consciousness. It can completely transform your current concepts and perceptions! At last, you realize your kinship to others in this galaxy. Planetary xenophobia can then be replaced by heightened galactic awareness. As fully-conscious citizens of the Milky Way Galaxy, you can formulate a most magnificent galactic society! My dear Friends, the future is impinging rapidly on your present ever-changing, skewed perceptions of the past. This is part of the massive consciousness evolution now underway in you. It is necessary for you to become grounded in the vital concept of personal sovereignty and in the fact that everyone is an interconnected part of the whole. In effect, you are information-oriented Beings seeking knowledge of the whole and wisdom from the eternal. Contact with another galactic society is a major event for all involved. It signals the further vast expansion of your reality's limits. It gathers your old concepts and moves them, exponentially, toward "yet-to-be-dreamed-of" horizons. It places your technology and your consciousness into direct communication with a much larger sea of creative potential. Every advanced society reaches a point where it either acknowledges its place in divinity by asking for outside assistance or moves toward isolation and subsequently perishes. Currently, you are at this most critical of crossroads. Your secret global rulers symbolize the control group deeply desiring to separate you from your sacred heritage. We ask you to ignore their many prevarications and their substantial power. We ask you to choose Love. We know that efforts made by all human telepaths when thought-addressing the star fleet are a shining example of the abilities lying dormant in all of you. We are aware of all who devote time and energy to protect and dispense interstellar information entrusted to their care. In time, a doorway onto the golden streets of a dawning new world will open before those of you who have dedicated your lives to interact with beings of light who serve Prime Creator. We bestow our gratitude upon those who fearlessly assimilate extrasolar data. You who hold faith and trust as to what can be accomplished by beings who dwell within starships will see. Yes, very soon you will see! Ponder deeply upon our remarks! Ego enhancement or ego loss is one of the most objective indicators of overly delicate human psyches. Individuals wishing to attain fifth-degree vibrational status would be wise to energetically neutralize all negative-radiating energy that lies within their emotional and mental bodies. 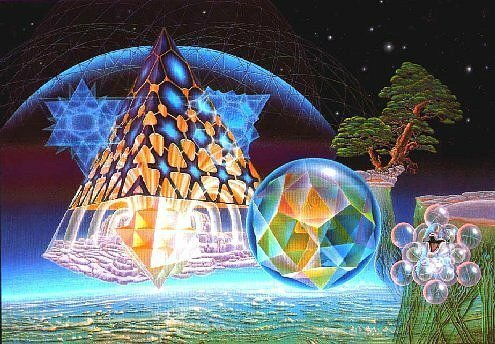 It is virtually impossible to transport a third-dimensional being's cellular matrix intact into a fifth-dimensional craft without an extensive organ-by-organ vibratory "remodeling" prior to the exchange. Therefore, human starship visitation is accomplished by raising the etheric, or spirit, body into the vessel. The human's experience is that of an intense, realistic (but dreamlike) out-of-body episode. .. Sensations associated with such an event would be quite dramatic. However, boarding the starships and meeting extraterrestrials face-to-face are rather ordinary experiences. Though she (Patricia) is unable to explain the details of these events in a manner acceptable to the scientific community, nevertheless, her growing state of spiritual clarity has shown her the reality of her paranormal experiences. We are exceedingly proud of the courage displayed by all humans who, with insightful open-mindedness, are answering the call to actively interact with fifth- and sixth- dimensional beings of light during these accelerated, evolutionary times. -Patricia Pereira from her book, Eagles of the New Dawn. "Extraterrestrials exist intrinsically to themselves, and yet, are modified by your perception of them. 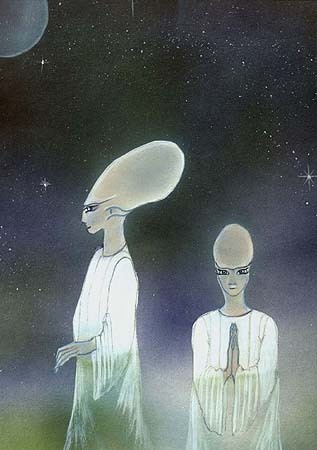 One might go so far as to say that extraterrestrials are 21st century angels. They are the same phenomena, only viewed differently. You draw forth energy from the collective unconscious. You draw it into containers or forms. You may call them angels or you may call them extraterrestrials. You interpret them according to the expectation implanted in your personal unconscious. In the same way that you create each other, the world, the grass, the stars and the trees, you also create these beings. You draw them forth. You call them forth through a kind of unconscious invocation or convocation. You bring them out of the collective unconscious when you need them. It is important for you to interpret these beings in a positive way, to interpret them as friendly, and to know them as they are. You really do have control here and if you start to interpret them as unfriendly, you will create an enemy for yourself of great danger and great complexity. But rather, know all beings as friends, and friends they will become." "We are talking to you about the synthesis of consciousness, the coming together with us to realize that there is no separation. You could call us "access-codes" in the unconscious as you come into rapport with us. In truth we whales find ourselves merging with you more and with greater ease. You may no longer distinguish between what is your space and the place known to all as the Universal mind, the collective pool. You have wanted to experience the greater Mind. To make this communication possible, we whales draw from your language, your vocabulary and your memories. You are beginning to realize, as we have always, that there is no separate "I". Now you are more open to our beaming directly into your psyche. The archetype of the whales serves as a symbol that allows the mind to go deeply into the universal mind and draw forth information. What you are experiencing is a collection of ideas being expressed and experienced without the presence of a form because a physical Being is not necessary." the more the One Mind comes into being, the One Mind of love and light. So as we become transparent, the phenomenon occurs almost automatically. When the ego-boundaries begin to dissolve, we experience first fusion and then merging, and then co-identity where there is no longer any whales, people, extraterrestrials, individuals, etc. There is only a blending of energies, an interaction of emotions and moods, a process that continues with no processors, no persons to experience, but rather only the experience. There is no end to experience, regardless of what happens to what you call your physical bodies. The process does not end. Perception, thinking and being do not end. In reality, in truth, we are process, endless process." WE know that when you hear the term "whale" you tend to think of a physical organism. Human beings always tend to think in physical terms. You tend to think of the whales out in the ocean. That is only part of who we are. WE are mostly a symbol. As you move into group mind, the whale becomes a picture in your mind. This picture can become a homing device for you. This symbol of the whale becomes a way of moving beyond the collective unconscious to the pure state, the state of illumination and peace. Physical things, living organisms, are sacred. We interact honorably with all things that are sacred. We use the physical world to glorify the one Spirit and to manifest the Spirit of Love. But we are all much more than that. As our minds merge and become one, as they blend, interact, as they are fused together, then identity becomes not a matter of form, skin, flesh and bones, but rather Mind. In that Mind there is a single, vast, telepathic network. WE are part of that, you are part of that. About 20,000 years ago we whales merged with a civilization that began to question the traditional beliefs of duality. They began to question the image of god as known to the primitives. They understood that the only thing they could prove was the existence of their own minds. In proving this to themselves, they realized that all things must come from this premise. Therefore, they knew that the premise of an external god, localized in space and time, and created in the image of man, must be a projection, a theoretical assumption, and only a speculation. The only thing they could prove was that they existed. After proving to themselves, by their perceptions, that they existed, they proved that the world of their perceptions also existed. This was as far as they could go. They needed to go no further because they proved the basic premise - that mind is, and, through the existence of mind, all other things have their relative existence. The world is a form of light created by mind, gathered and coalesced by mind. This is all they needed to know. They became the civilization that believed in the oneness of all things, they started to examine how all things interacted with mind. They examined the creation of the emotional nature. Through this examination, they came to the realization that they could not blame other people for their situations or their thoughts. These were the first people to take full responsibility for their minds and their lives, never blaming, judging or questioning anyone else, but allowing all things to be. BY studying and observing all things with great interest, they came to understand that all things were reflections of the One Mind, and of their own minds. Everywhere they looked, whether at the flowers, the birds, other people or even to good and evil (as they knew and defined those terms) they saw the reflections and distortions of the One. They also realized that people could not overcome their beliefs simply by intellect. To open to the One Mind, they needed to experience the full Love-Nature. Enlightenment comes only after Love. They knew that in time and space, it would take people many centuries to come to this point. They would need to become incarnations of Love. This is what is occurring now on planet Earth. We are all learning about this. This Love is true freedom. People do not always know what they are learning or what is being taught to them, but the seeds are being sown. These things are taught by transmissions of the heart, by the spirit of Love. Illumination occurs when brotherhoods and sisterhoods of human beings and beings of other species, surrender their personal wills and are touched by the Light. They become vessels of Love. They show compassion to the world. We are to love each other. These are the things we whales share." The well-known seven-star system of the Pleiades is an open star cluster in the constellation Taurus - 420 light years distant from us - and is composed of relatively young stars, planets etc. The designation "seven-star system" is derived from the fact that at least seven sparkling stars can be seen with the naked eye on a clear and starry night in the northern winter sky. However, the planets of this system are in a developmental phase that is still totally unsuitable for human life forms at the present time. The home stars and planets of the Pleiadians, with whom Billy Meier maintains contacts, are located in the same region of the sky. However, they exist in another space-and-time configuration and are an additional 80 light years beyond the Pleiades. 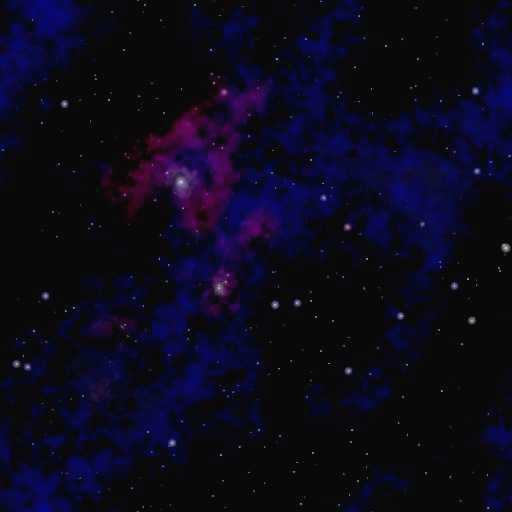 One of the sun systems located there bears the name Tayget, the central star, which is orbited by ten planets; four of these are inhabited. Those human beings living there we call Pleiadians. Yet they call themselves Plejaren (pronounced pleh-yar-en) according to their system, which bears the name Plejaren. The human bears a spirit that does not die nor sleep during the deepest sleep; it records all thoughts and motions; it informs the human whether his thoughts are correct or false-if he has learned to pay attention. The spirit within the human is the bearer of the creative realm, and every human has his own (spirit). It is incomprehensible that the human speaks of a heaven and of a kingdom of heaven within himself, rather than to merely say: Creation, truth, knowledge, wisdom, spirit, consciousness and existence. A humans yearning lies in the joy that remains, for the imperishable life, the permanent peace, the spiritual and consciousness-related wealth that never fades and lasts forever. Heaven and Earth will perish, but truth, knowledge, wisdom and spirit will never be changing [change?] or perish. The spirit and the consciousness are on the look-out for what is perfect, for harmony, for peace, cognition and realization, for knowledge, wisdom, truth and beauty, for love and for the true BEING, all of which are of absolute duration. All of these lead to what forms the spiritual kingdom of wisdom; all are existing within what is creative. All of these are here in existence, as a genius of all ingenuity, as a melody of all melodies, as ability of all abilities, as the highest creative principle, as wonder of all wonders. The human may create wondrous worlds in a dream, just as Creation consciously creates the worlds. To the human, this capability arises from his consciousness, which is obtainable in existence within himself, in the same way that all wonders are available within himself. He himself is the realm of heaven, the realm of what is creative. That's why the terrestrial philosophers of old spoke about the human as a microcosm within a macrocosm because everything that is included within the universe is included within the human. The inner dimensions of the human are endless. The image of Creation, the spirit within him--the existence that is without dimension--it bears all dimensions within itself and, at the same time, transcends all dimensions. The spirit is the wonder of all wonders, and all power emerges from it. A wonder means using the spirit force in perfection. The human, however, places a wonder into something for which he lacks all possibilities of a logical explanation. If a human is happy, his happiness comes from within, because happiness is a self-created state; never is happiness a location. Joy comes forth from the humans inner part, created by spiritual poise. Therefore, everything comes from within. The things that, or humans who, seemingly form the cause of happiness, are only the external occasion to bring the happiness within the human expressing itself, if he has spiritually worked towards this. But happiness is something that belongs to the inner being, and it is an unseparable characteristic of the spirits existence. Endless happiness and endless power are included in this existence. This is a Race of ocean living extraterrestrials who came onto the Earth plane through what they call a WINDOW IN TIME. They came into the oceans of planet Earth to assist humanity during these times of great changes and evolution into higher experiences of Consciousness. They are experts in this field. Their role is many tasked. They serve as examples of harmonious living among many oceanic species. They use the spiritual powers of their mind and higher awareness to survive on planet Earth with great joy and appreciation. They own no possessions and yet they have all that they need to live a healthy, active and stimulating life. 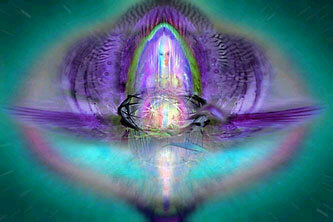 In addition, they use their individual and group energy to heal and to correct imbalances created on Earth. They assist people emotionally, physically and spiritually to find better ways of living on Earth while helping the Earth to sustain life and remain an integral part of the solar system. 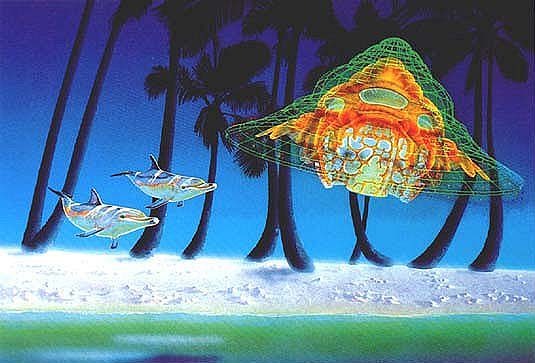 This has been proven repeatedly by the testimony of hundreds of thousands of people who have swam in the ocean environment with these highly intelligent and spiritually aware entities. As people learn to respect and love the dolphins, they are able to understand other Extraterrestrial Cultures who are also in contact with us in differing environments. The dolphins are here to help us and they do this through the frequencies of Love, Joy and Harmony. They send these frequencies into the water, using sonar and sound, and change the molecular structure of the water that swirls around us. They create a field of harmony similar to that of chanting monks. In addition, they affect our bodies when we are in the ocean with them, by helping us to elevate our awareness into greater streams of advanced wisdom, stimulating dormant parts of our human brain and awakening memories of our connections to higher consciousness. We learn to access these sleeping aspects of our spiritual selves by accepting loving energy infusions from the dolphins while swimming in the ocean. These newly awakened aspects of ourselves, lead to a quest for justice and cooperation among all life forms. It causes us to promote humanitarian, benevolent, leadership with equality for all. It causes us to love all of life and to protect it with our lives, our wisdom, our voices, our books, our art and our lifestyles. We turn away from secrets and hidden agendas and choose instead integrity, altruism and peace. In fact these humanitarian and spiritual goals are then out-pictured in our daily lives, bringing about constructive changes in the world. We are fortunate to have the extraterrestrial beings known as dolphins and whales in our waters where we can convene with them for brainstorming and mutual sustenance. They invite you to enter the oceans of the world and meet them as often as you can. Mankind's duality is represented in the two halves of the brain. In truth, the logical functioning of the brain is necessary only in the lower dimensions. What seems logical is what appears in the reality in front of you that you have created. It is logical that one brick sits on top of the next brick. But if you remove the logic, you see only the energy, and you will see no actual separation between the bricks. When you release the need for third dimensional physicality, you release the need for logic. That does not happen automatically, it comes with understanding. When you begin to understand, you will know these things. Firstly, that you can change shape, or be somewhere else in an instant; that you can fly, and send and receive telepathy. When this is fully recognized, the left logical side of the brain becomes unnecessary, and more of a hindrance than a help if it interferes too much. You see, for you there is no logic in being able to fly. If I asked you now, Can you fly? you would say, No, I am too heavy. The force of gravity is too strong. It is an impossible thing. If you left your physical body then you could astral travel freely, but as you are still within your body and you relate as being that body, then your logical mind dictates that some things are impossible. Your logical mind dictates that you cannot pass your hand through a wall. In reality, with manipulation of molecular frequency, all is possible. As a species you are traversing from logical to spatial thinking. Whole-brained thinking is the middle path, not the ultimate goal. Within the right hemisphere of the brain, all your latent abilities are held. To access this fully, it means not trying to logically understand, but knowing, feeling and grasping concepts without words. If you can forsake your logic for just a while, you will begin to realize the many levels and stages of development that there are to be reached within the right brain.
. You have the ability to change from one thing to another; to change your cellular structure, your energy body. it is right brained. The energy of telepathy knows no boundaries. Telepathy can span a universe; it can take you from one place to another, so that your whole essence is present in another dimension if you wish. 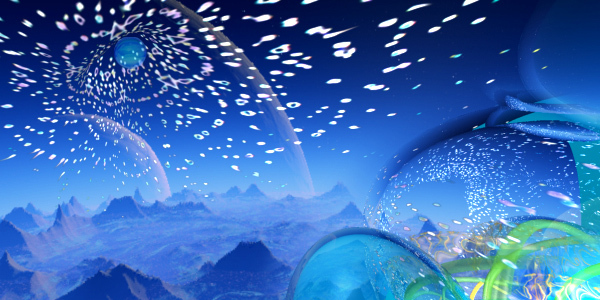 Our energy fields can change to suit various dimensional levels - for example, seventh, sixth and fifth. There are some races living on our planet that have a very humanoid form, and have physically solid craft in which they travel. They don't travel the universe as you on Earth understand it; they time warp from one place to another by thought conduction. Elaine asked why they were making their presence known, not only to her but to others around the world. The Sirians replied, We want the people of your world to know who we are and have the opportunity to learn about us. The representative from Arcturus is here on a somewhat different mission than ours; we have agreed on different agendas. He has a much wider spectrum of interest in the flora and fauna of the planet, including your wonderful dolphins. His group is spending more time with matters of a physical nature, concerning themselves with planet Earth and its condition; the land itself and the atmosphere. We from Sirius are more attracted to the soul aspect of the human beings, and we are here to try to help you learn about yourselves. We hope we can teach you about transmuting from one dimension to another. We can point the way, giving you instructions as to what you can do for yourselves in the future to make the way forward easy, but in truth, you must do it alone when the time comes. There have been times when our friends from the Andromedan Galaxy have visited you. Their primary interest is the brainpower and creativity of mankind. They want to study the emotional concepts and feelings that everyone experiences on this planet. The Andromedans say that studying Earth people is like being presented with 60 billion computers all working at different speeds and rates. Their interest is to find how you are expanding emotionally, and to what extent your knowledge is growing. Within this emotional cycle, which you as humans go through from birth to death, the Andromedans include reincarnation and the development of emotional purification, highlighted by the universal need to refine the emotions so none is lost, all are perfected. Sirian: ..About the nature of our bodies, and how they function. Concerning osmosis, I must tell you that not all bodies function in this way. Some races that exist on other levels need nothing but light and energy to sustain their form, and on yet other levels they need not sustain a form at all. Only consciousness is present, and they can if they wish, take on any given shape or form at any time. We however, encompass the seventh through to the fourth dimensions on our planet, and can choose to interact with other beings. Therefore we have multiple choice on which physical shape to take. We tell you that you too, as a race, will eventually be able to take more nourishment from energy rather than your normal food. Beginning with solar rays, and the electro-magnetic fields that surround your planet, and in time, eventually using a form of osmosis. There are people on your planet now who are working towards this end. They eat only fruit, and some take no food at all. We understand that those people who live with only this kind of nourishment are finding it increasingly difficult to sustain themselves normally and still be part of the everyday life on this planet. 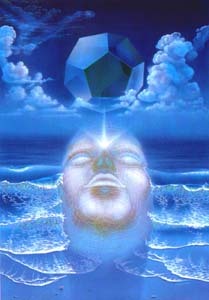 A dimensional or consciousness energy shift of the body and mind is needed whilst doing this refining of the body. You cannot survive well in the density of third dimensional matter on fresh air alone, as you would put it. It is a very difficult thing to do, but as you make this shift, and lose your density you lighten up in every respect, mentally and physically. You will find that you need less and less food, but you must ensure that you are selective in the quality and quantity of what you eat. You will find that simply by taking a walk by the sea, or being out in the sunshine, will nourish you almost as much as a full meal. This is something that we will teach you. There is much more energy inside, outside and around you than you could possibly see with your third dimensional eyes. We hope that we can teach you shortly how to begin to see things from a fourth dimensional aspect, with a slant to it that comes from a fourth dimensional point of view. 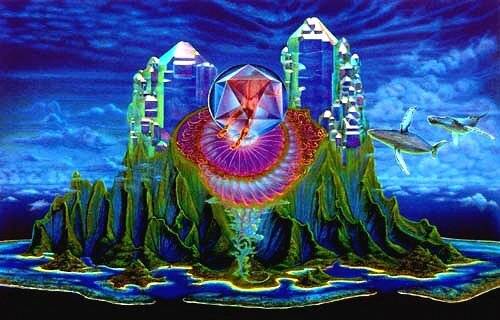 Those of you who have developed the ability to see clairvoyantly, and those who are developing their spiritual knowledge to a higher degree are now beginning to see into the edges of the fourth dimension as auras and energy fields. Sight in physical terms is not the only sense that can go forward into the next dimension. You must learn to feel much more than you do now. You can call upon your intuition or inner knowing, and begin to sense much more around you. Your sense of touch can be developed. Noticing energy fields and allowing your sensitivity to them to become much more refined than it is already will start to develop for you a parallel existence. When you begin to develop these higher unused senses, you will be much more aware of the forces of energy around you. These energy fields exist everywhere, and just by walking along a road you can know that you have passed perhaps through a fourth dimensional building. You may enter a green field and will sense that you are walking in fourth dimensional water. It is there but you don't see it. You feel it. These extra senses are not limited to those with clairvoyant vision. They can be felt by anyone and can be completely adapted to encompass your whole being. Every single cell in your body knows when it hits an electrical field or an energy change. We know you have verbal expressions, saying your hair is standing on end, or you feel goose bumps on the skin when you feel a change in the atmosphere. If you learn to feel and extend your senses as you walk along, you will encounter much more than you ever realized was there. Once you realize that something is actually there that has not been perceived before, you can then begin to see it with your mind's eye. This will help to bring it closer to you in a reality form. This is part of a book by Dr. Courtney Brown entitled Cosmic Voyage in which Dr Brown is remote viewing the Martians who were transported to Earth during times of cataclysmic changes on their planet known as Mars. Modern Martians have no place to seek refuge other than Earth. This civilization seems to be living beneath the ground in the area of New Mexico, USA. They are not mixing with Earth people because they do not feel the human race on Earth would receive them kindly. They are a group of ETs, here on Earth now, who could use our assistance. Following are some of the remote viewing experiences of Dr. Brown regarding the Martians in the present time. On a blank piece of paper, I draw a rounded mountain. The top of the mountain is bald, but there are trees farther down. There is wind hitting the surface of the mountain. I am going through the matrix now. There are people. There is that mountain again, and the wind. Wow! I am picking up strong fear, also excitement and relief. It seems like there are lots of emotions here, with different people having different feelings. I am getting some kind of airborne vehicles, and lots of frenetic activity. The people are caught up in the activity, perhaps not of their own plan. These people do have a plan they are working on, although I still cannot tell if it is their own plan. .. I am picking up an ET ship. Polished, metallic and warm. I have this thing going right into the mountain! Right through the rock! What is this? technicians. Everyone seems to have a uniform. I am now inside some kind of cavern or hole inside the mountain. The ship has landed in the center of the place. .. And I keep getting the sense of Martians. The remote viewing evidence suggests that the mountain is Santa Fe Baldy, New Mexico. Into the underground chambers - The place is modern, but not supermodern. I see men here, no women. There are workers here. This is not a happy work environment. These people are here out of duty. I am going further down. They live down here. Virtually a city. There are many caverns and tunnels. Machines are all over the place. It is more comfortable here than in the work caverns above, and these people could live here a long time. I detect a fear of leaving this place. There is no future for them here. This is a dead place. Describe what the people look like. Well, I see males now. They have humanoid faces, but no hair. They do not look exactly like normal humans. It is like they are a different race. They seem to have mental machines as well, like devices that interact with their consciousness in some way. Their minds control the devices. The beings themselves are light-skinned. They also seem rather weak relative to humans. I was beginning to realize that the ET situation was much more complex than I had previously thought. It was no longer a simple situation of ETs flying around Earth. There was real purpose behind their activities, and I knew that at least some of the Martians were in considerable difficulty, and may have been for quite some time. We wondered how to help the Martians. They had long lived underground, hidden from the harsh conditions of their homeworld's environment and from human hostility on Earth. I am being told that humans will meet with the Martians near their home - the New Mexico caverns. The Martians have great fear. We (humans) must help to bring them out of the caverns.
. The Martians will need formal talks. We need to proceed one step at a time. I am being explicitly told that we will not be hurt by the Martians. We are to go to them, not to expect them to come to us. We are to begin by training more people. It seems like training is a big thing. Remote viewing is a part of it, but there is more. (Information about learning to work with telepathically capable subspace beings, as a way to promote human evolutionary potential.) It is one thing to get the Martians to want to deal with humans. It is quite another thing to get the humans to want to interact with Martians, and both my trainer and I feared that the latter problem was going to be the more difficult one to solve. We sensed that we needed help with the human side of the equation. Yet we both felt deeply on an intuitive level that neither one of us would have gotten this far if there was not some hope of a solution. In a sense, we felt that there was someone else watching what we did, and that somehow the resources would be made available to us when the time was right. For now, we could only proceed, and to move forward at this time simply meant to collect more data and proceed to write a book on the subject. The UFO and extraterrestrial phenomena is not about little gray men of different life forms. It is about understanding the marriage of consciousness and science. It's about learning how unknown universal principles can explain what is thought to be impossible. Most importantly, it's about our human spiritual evolution and relationship to a higher consciousness. In our pursuit to understand reality and consciousness, we have taken two different tracks. One is the way of the scientist, who requires measurable data and concrete evidence to quantify an event. The other path is the way of the mystic, who chooses to blithely accept experience and just know. Perhaps it's time to quantify the mystical by extracting the best from the scientist and the spiritualist. In some ways, we have begun to do this within quantum physics. It was here that I discovered parallels to my teaching that allowed my scientific mind to embrace the seemingly impossible suggestions they made about the true nature of reality. As we prepare to come into increased contact with other beings, we will need to understand as much as possible to meet them on their level. By learning about the deception of time, reality and creation, we can begin to fathom the mysteries they already know. They continued to lecture me during another transmission and included an explanation as to why my life seemed so difficult and out of control with divorce, work harassment, isolation, and painful emotions. Let us speak of the issues, for it is of those that you have also asked to have discourse tonight. The tests as we have said get harder and more furious, and they are more difficult to undergo. You are in the midst of a significant wave of events which is impacting the progress of your life. They are coming at you rapidly and with great intensity. You have decided to undertake many things and overcome them quickly to get onto other pathways in your life. That is why there are so many multiple dramas with great difficulty. For the lessons must be learned and must be accomplished before you can pass on to the new areas. That is why you are enduring so much, and it is so difficult, and it is wearing you out. You know and we know that you have the strength to overcome these and as quickly as you would like. It is no one but yourself that holds you back for in many ways you are your own greatest enemy. You know you have the capacity to go anywhere you wish to go and to accomplish anything you wish to accomplish to bring forth the events to you which you need. You have the higher knowledge to direct events to those as you wish, so long as your motive remains pure. But once you stray from that, then other events will be brought to you to bring you back into focus. One very hot summer day, I went for a walk. For some unexplained reason, I looked below just as my foot was about to come down on a young rattlesnake. I froze, backed away and ran toward the street. A man came along and saw my distress. He went over to where the snake was. It remained there, lying complacently. He began to throw pebbles at it and I felt great remorse. The snake wasn't hurting anyone; there was no need to antagonize it. It coiled, rose up and hissed, then finally slithered away. That night, I decided to ask why this encounter had come my way. A portion of the message contained a warning for me pertaining to the unpleasant work situation described previously. The session ended with information about the influence of present events upon past and future times. It was my first introduction to the tenuous nature of reality and how linear time is continuously impacted and changed. As all things on this Earth are symbols and messages for those who have the ability to see them, this was an illusion chosen to convey a particular thought. The snake is associated as a sign of wisdom and higher learning and is often regarded quite highly in mystical circles. We knew that this image would be recognized by you. Coming so close without recognition was a warning to watch closely all around you. Events will unfold on different levels, and you must take the information and integrate it into meaning for you. You came so close to a situation that could potentially have danger. But you knew not how the snake would react. And did it not just lay there and have no response to you? You felt remorse at the one who threw pebbles at it and it would have been best to speak up to support the peace of the being who lent its energy to convey the message to you. But that little one shall go on and is now on its way to its other journeys. So the message was to watch all around you, pay attention, particularly to the learnings on ALL LEVELS. Like the parables of the one who walked the Earth a long time ago information is imparted at the level of those who receive it and the same information can be interpreted in many, many different ways by different people. Again, integrate, watch, and carefully build your own set of reality that has meaning to you. These instances that still amaze and shock you will continue, to get the message across to you. For this is how you have communicated that you need to see information to accept it. It still must come as a bit of a shock to you to get through to all levels for you still deny so very, very much. In this way you try to return to the life that was safe and known to you but you have set forth and there is no going back. There is "not going forward" but there is NOT going back. For what was once, is no more. As we travel the path of knowledge, learning and what you perceive as time, instances continue to change. And it is true when one recognizes that one cannot go home again. That is because the dramas and situations have changed due to the influence of present, current and even future events upon those paths so things will never be the same. There may be different paths to choose to take and to walk upon, and some may be more parallel than others and emulate the former image that you once knew. But it is not the same image. Events will begin to pop forth now, ones that have been planned long ago; it is their time. They shall erupt to the surface in a manner that will allow them to manifest and bring about the actions that need to occur. This will be a pivotal time, an important time. Though each day will seem slow in its passing, there will be something there that will have bearing on what you know as the future; we know it all as one. No past, no present, no linear time. All simultaneous, all multiple pathways with probable and different results that occur at once, that shape and evolve beings to the highest level possible. The focus of attention in the human form is on one particular area of concentration; those are the images that you draw forth and (from which you) build your current set of reality. As the mind is designed, it can process only so many things at one time, except in the cases of higher evolved beings who can multi-track their minds to take in multiple levels and sensory perceptions. You can do that in the beginning stages, as you have learned throughout the course of your life. You are at the evolutionary path now where you can multi-track. We are using one of your words, anti we know that you recognize it as such. You have not yet learned proficiency or excellence in this area, but you have the capability and have demonstrated as such. In time, the experience will improve and the products will be better. Like all things, practice makes perfect. Events in the world shall continue to erupt, but there shall not be a major action of significance that will tilt the course of events at this time. You shall still be going forth and learning the lessons of a personal nature at this time- that is what the rest of this year is all about. The players shall come forth and fill their parts and help to build toward the future. Enjoy the beauty that is brought to you and do not dwell on what you perceive as disappointment; it all serves its purpose of higher growth and learning. It is not the drama and events, bat it is how you proceed and process through with your lessons. We know that you know that, for you have tried to teach that lesson to others as well. But do not forget that it also applies to you, and though you contend with the difficulty of human emotions, work them through to the highest level possible for you and you will proceed. Timelines that we have are much like the timelines that you use for projects. They are updated, they're changed, they're shortened, they're varied, and they're flexible but they are there. Don't forget to use them as an efficient and effective tool for guidance, but they are only timelines and nothing else. The grandiose lesson of unconditional love, the highest, most elevated lesson known to man. For with unconditional love, one can walk all planes and go all places. For you bypass the lower emotions of the levels of man. This is a great lesson. Over the last 15 years, Bashar has spoken through channel Darryl Anka, world-wide, and his basic message that "You can be the conscious creator of your desired reality" has helped thousands of people improve their lives. Bashar would be the first to say that it's because this information is based on the laws of physics and is not just a "nice New Age philosophy". Perhaps this is a more advanced version of physics than you may have encountered in the past - but nevertheless, it is based on physics. Hence, when you apply these principles and techniques to your day to day life, you can see dramatic results, both in what you experience and how you feel! You are spiritual beings having a physical experience. Dreamtime is your natural state. You are very much interrelated and interwoven with many beings in that reality. Therefore the dolphins have never forgotten this. Even though they project themselves, and they do so in a physical way, they have remained in touch. Anything your imagination can conceive of, is somewhere, somehow, a real reality to someone. By interacting with you, the dolphins are allowing you to realize that your physical reality is just a dream in that sense. But that that is what reality is, and you can create that reality to be any type of reality you wish, instead of assuming that your physical reality is something you have no control over; and that you have to settle with the idea of suffering and pain in your life. The dolphin consciousness basically lives in ecstasy and they desire that you can as well. They also interact with many other civilizations. They understand the enjoyment of sound and truly see sound as a shape and make sculptures for their own appreciation. As they interact, they truly create entire environments that in every way, for them, is every bit as real as the physiological objects with which you populate your reality.
. As your society did, as well, thousands of years ago, but have forgotten. These are some of the things the dolphins can teach you again.
. Whereas your land environment because of your physiological gravity, does not make that kind of manifestation as likely. Therefore it is up to you to learn to accelerate your body upward into a more rarified, less physical state. They can manifest thru a physical state. You can do it thru the acceleration of your physical state that you already have. 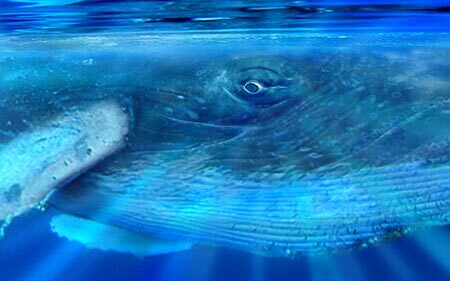 When you associate with the whale on your planet, you are dealing directly with a form of mass consciousness and it can trigger many things within each and every one of you about your own personal associations with your higher self and your own collective consciousness on your planet. Then you can begin to function as one unified society. The notion of functioning as a unified society does not mean you lose your individuality. This is a myth, that the unified consciousness is created at the expense of your individuality. It is a strength that you will experience. Also, there are many other extraterrestrial societies, alien societies, that could be in contact with you. Remember you have one right here in your ocean. And when human beings begin to truly blend and meld with the dolphin and whale community, melt with them, you will truly accelerate into becoming a unified planet that will then be able to operate on a vibrational level that will make it easy for you to interact with other whole civilizations. You are in every way as equal and as powerful as any being no matter if you are exploring limitation and negativity or ecstasy thru positive understanding. 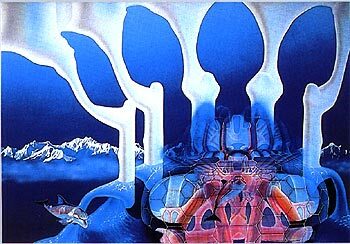 You are transforming and the dolphins and whales can assist you in this greatly by one fundamental methodology. Allow them to remind you how to play! To remind you of your true essence, of your true spirit. For they know how to live in ecstasy. They are very willing to teach you. Feel them, in that sense. Feel the vibration and interact with them as much as you can in their environment, and allow them to simply reflect back to you how your society can ecstatically create reality if desired, rather than feeling you must be at the mercy of what you call a segregated environment. The idea in that sense shall be to allow you to feel within yourself the interconnectedness you have to all life not only on your own planet but on many other planets as well. Right now you are choosing by interacting with us in this way to be ambassadors to us from your society. There are many individuals on this side listening in. We thank you for allowing me to be the representative of our collective of civilizations, which is called the Association of Worlds. These interactions between us create more ability for our society to interact face to face. The easiest way to do that is to begin to interact with your selves as people first. Because only when your planet is of a vibration where you know all is equal do you make it possible for others to know the same thing and be able to interact with you. We thank you for your gift of letting us experience your consciousness.